Ted Williams then Will Clark in more recent times. Some that haven’t been mentioned. Gregg Jeffries had a beautiful swing. One swing I loved to watch was Juan Gonzalez. Any other answer is wrong. I’ll throw Thome out there and actually post a gif of it. The correct answer is Griffey and there really isn’t an argument. Ken Griffey's swing was technically almost perfect,very little wasted motion. It's why he didn't get tired while winning home run derby. Will Clark had a very fluid swing, but a little too much forward motion. Ted Williams used a hitch to start his swing, otherwise top notch, and maybe the smartest hitter. The contact hitters like Carew, Boggs, Gwynn, etc. all could put the bat on the ball as well as anyone, but less hip turn hindered their power. Willie Mays had the fastest bat I ever saw in person., but I was more impressed with Stan Musial's swing. wasn't around then, but I am sure there were a few with great swings. I'm shocked that this guy, who's swing was so incredible that his misses turned into fantastic swings/pictures, hasn't even been mentioned. 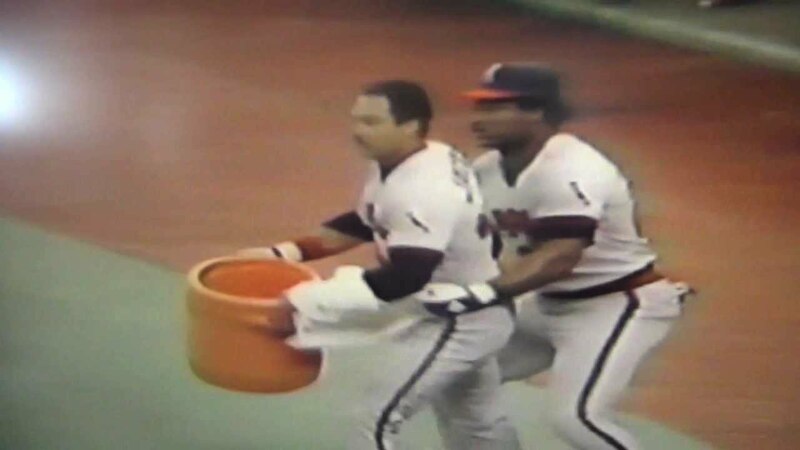 When he was with the Angels and faced Gaylord Perry, he was so pissed at how bad he swung and missed he went and threw an ice bucket on the field. Gaylord was throwing him spit balls. Do you even launch angle, bro? A lot of great swings could vie for #2 including Reggie Jackson who hasn’t been mentioned.